1985. 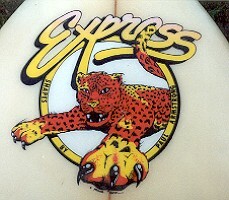 Express Four fin Kneeboard 5ft 7". Foam blank, 1/8'' redwood stringer, fibreglassed, finboxes, spray decor, left hand legropeplug. Tail: diamond, with very slight flyers. Bottom: round - flat to half way, then vee with four clinker channels between the fins ending at 1/4 inch step bottom, full pintail. Two Dion Chemicals 6 1/2 inch Fin boxes, set @ 15 inches. Deck: Large black Express script on rails. Bottom: Large Black/yellow Express script, Shaped By Paul Armstrong text in circle with cheeta graphic on nose.Image right. Purchased Cash Convertors, Miranda NSW October 2000? Fitted with large fins only, the trailing fins had been removed. "I was amazed to see one of my old boards in your catalogue. The above board was the first board that I ever did a 360 on!" Date (my guess was 1985) ? Not to far wrong. From my recollections maybe '84, '83 absolute earliest. Decor design and/or spray by ? Paul Armstrong (shaper & owner of Express). I used to let Paul have free range on spray jobs. The board did not have the trailing fins when I purchased it - any idea of their dimensions? All of the fins look unoriginal. Paul always used white fins and I'm certain that's what was on this board. As for size they look from the photo to be bigger than the original. I can't remember the sizes but the ones in it now look wider at the base and the trailing fins look about 30% ?? bigger. Do the numbers CO684 mean anything to you? No. I think this would have been some sort of order/job number for Paul. making boards in his garage. Thanks to Craig Joubert for his contribution. 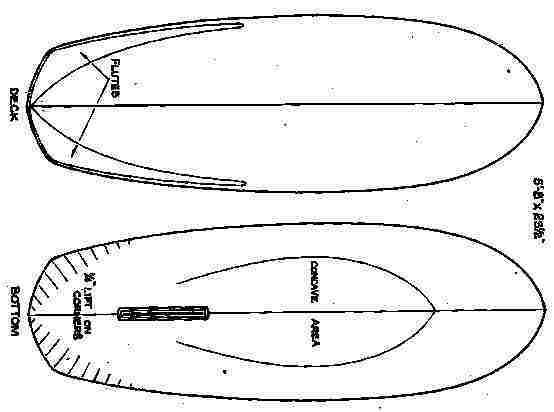 Following the success of Simon Anderson's Thruster in 1981, several variations in fin placement and size were tried, one being the Four fin by Glen Winton from the Central coast, NSW in 1981. - Young: Fundamentals (1985) page 102. 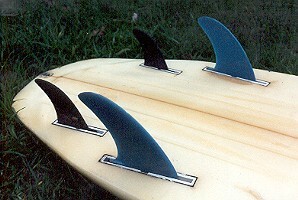 The four fin, Cheyne Horan's Winged keel and the return of Bonzer side fins (in a five fin configuration) all had some limited application, but with the introduction and popularity of plug fin systems in 1990, the basic thruster set up has maintained its superiority. Surfing World magazine Vol 25 # 3 July 1977 pages ?